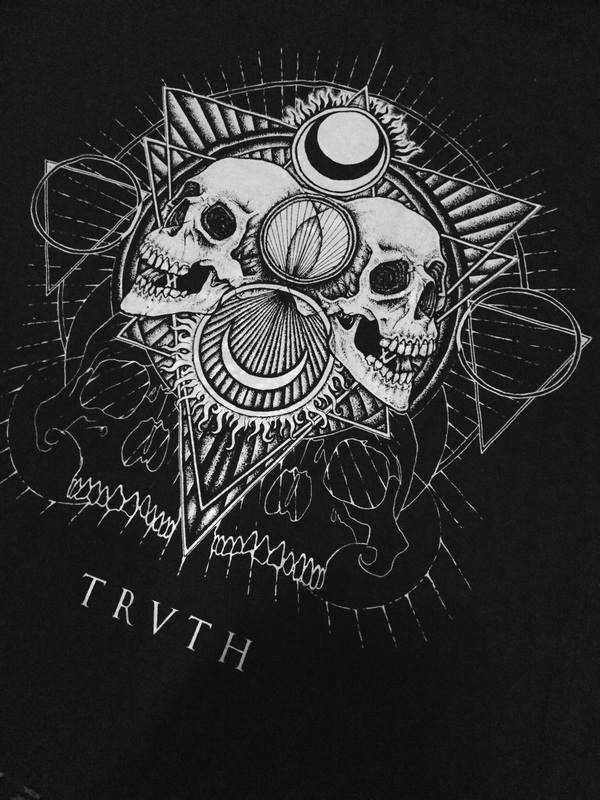 Truth Within Time | Sloan: Art, Drawing, Tattoo and expressions. Sloan: Art, Drawing, Tattoo and expressions. I have packs of seasonal cards available from the shop (link above). All priority shipped same or next day. There will be free international shipping on all prints and shirts. Head over to the store to order, all orders come with a free patch. Gig poster for Unmothered’s show with Ufommamut last year. Pen and grey wash on paper. 2015. Very limited edition print of 10 available through the store. 32cm by 32cm on 250gm paper each numbered and signed. ‘Psilocybin Morte’ art print now available through the store. Printed on 200gm watercolour paper, sizing 23cm x 18cm. Also, my apologies to those of you that contacted me last year with commissions, I was not able to take on new projects. 2016 is open, taking new projects on from March, contact on sloanrock@live.co.uk. Artwork completed for the Unmothered ep Umbra. TRVTH shirts are now available in the store along with patches.